People walk on the 100-by-16 meter sections connecting the island of San Paolo with the island of Monte Isola. The art installation was created by Christo and Jeanne-Claude. ITALY — Earlier this month people were able to experience what walking on water felt like with the opening of an art installation at Lake Iseo in Italy. 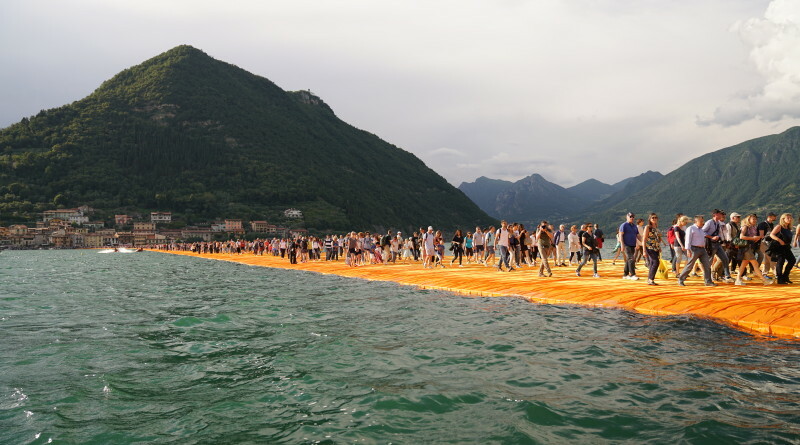 The Floating Piers, created by artists Christo and Jeanne-Claude, spanned a distance of 70,000 square meters just above the surface of the water. The modular floating dock system was engineered of high-density polyethylene cubes that undulated with the movement of the waves. The piers measured 16-meters wide and the yellow fabric coating the piers continued along 1.5 kilometers of pedestrian streets in Saulzano and Peschiera Maraglio, according to a press release. For 16 days this floating dock system covered in shimmering yellow fabric was walked on by large crowds who followed the path from Sulzano to Monte Isola to the island of San Paolo. The art display was Christo’s first large scale project since Christo and Jeanne-Claude created The Gates in 2005. The couple created and installed many projects in Italy including, Wrapped Fountain and Wrapped Medieval Tower in Spoleto in 1968; Wrapped Monuments in Milian in 1970 and in 1973-74, The Wall-Wrapped Roman Wall in Rome. All components of the exhibition were removed and “industrially recycled” upon the display’s completion in early July.